Why I read it: I love superheroes! DC decided to create a new universe “Earth One” that will remain separate from the mainstream universe. As far as I’ve been able to gather, this will allow them to re-imagine their iconic characters in a way that is accessible to this generation of comic book readers. 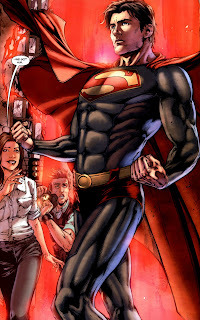 Superman: Earth One is the first title that will be published under this moniker, with Batman soon following. So, this story was supposed to be a revamp of Superman’s origin story. And while it did delve into what happened to Krypton, I’m not sure how much new was really added to Clark’s story. The title did show him wrestling with what he was supposed to do, he felt obligated to become Superman, but he did not know if that was really what was going to make him happy. He went to various job interviews to see if something else would fulfill him, and attempted to reject the iconic S. *Spoiler Alert* Then, after an alien force came to destroy Earth because he was hiding there, he realized that he had no other choice but to be Superman because no one else is able to protect Earth *End Spoiler*. I feel like the Earth One Universe gave this graphic novel tons of potential to work with. Having a completely new universe untied down by a character’s cannon should have produced something that really created something fantastic. But they stuck with the basic, Krypton blows up -> Jonathon and Martha Kent find a baby -> Later he moves to Metropolis -> He’s Superman! So my feelings are eh, a bit lackluster. So all in all, the story is a bit lacking, but even then it’s the first installment, so maybe it will progress into something really clever. When the next one comes out, will I read it? Most likely. Because even if there isn’t much story, the art is awesome to look at. This looks interesting! Definitely a more modern spin on comic books. It will be interesting to see if this appeals to this generation! And I think it looks like Edward but not TOO much. I read it just the other day... and you are right, nothing new here just a tweek or two. the artwork is cool but other than that, I could have passed it up. It's been sitting on my coffee table for awhile now, but now that the holidays are over I may be able to find the time to pick it up.